I've never been any good at applying any kind of eye liner, but since discovering Soap & Glory's Supercat liner I've discovered the easiest method for me is using a felt tip style liner with a pointed nib. I've previously used black eye shadow and a liner brush, but I much prefer the darker more obvious line that liquid liner provides. As I've now mastered using a pointed felt tip liner I decided I wanted one in a purple shade and one in a pretty teal/turquoise blue/green shade. I know YSL do a deep green shade in their shocking range but I didn't really want to spend £25 on just one eye liner. I headed to Boots but discovered that within their cheaper ranges black and brown shades are pretty standard but anything else is very hard to come by. The only one I found that was anything like what I wanted was Bourjois' Liner Feutre in Nior Violine. Ideally I was looking for something along the lines of a jewel type purple. 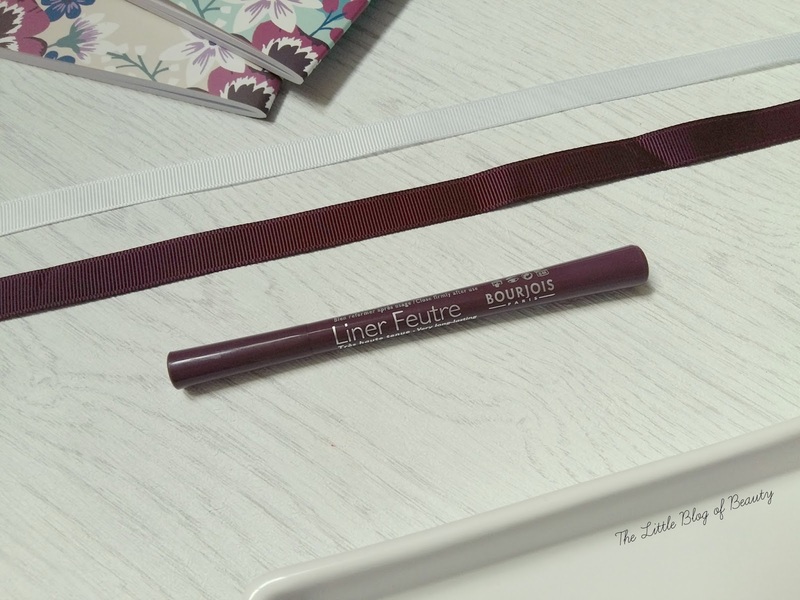 Although the Bourjois Liner Feutre in Nior Violine is a purple shade, as the name suggests it's a purple black, so it's quite dark. I asked my boyfriend what colour he thought my eye liner was and he responded with lilac, bless him! Despite his dodgy description of the colour it does show that it does look like a purple shade rather than black. 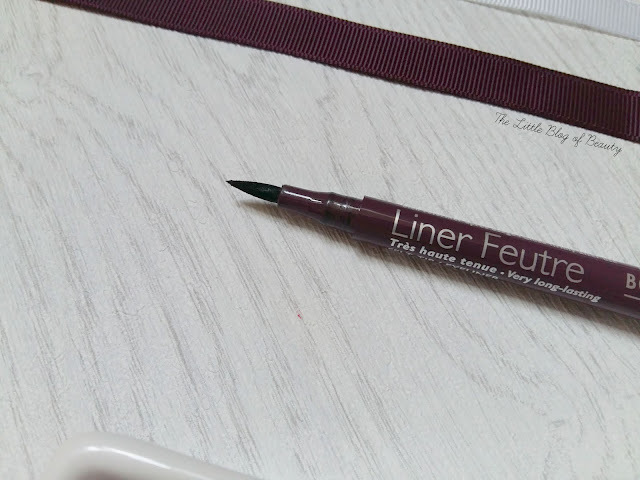 The colour may not be quite what I wanted but I have completely fallen in love with this liner as it is just so easy to use. There's no problem with the flow of the liquid at all meaning it transfers to the lid with ease and after a few weeks use there's no sign of it starting to dry up at all, which I have found with some other liners. This is so easy to use I can line both eyes quickly and easily and most of the time they're actually pretty even! Most of the time my liner is opaque from the first swipe but occasionally I do have to go back over a small part once it has dried. If you do make a mistake I'd recommend trying to correct it as quickly as possible as once this dries I've found that it can be really quite difficult to remove. When it comes to removing it I find that the liner comes away easily using an oil cleanser but it does stain my skin and depending on the oil I'm using this can be a little difficult to shift. I find The Body Shop's Camomile silky cleansing oil struggles but this doesn't appear to be the case with Clinique's Take the day off cleansing oil. I do suffer with very sensitive eyes when it comes to removing eye makeup but as long as I use a good amount of oil and go gently my eyes don't get irritated. I would say this is probably a good liquid liner to try if you're inexperienced as it is so easy to use, just be careful of any mistakes. I've found if you do make a mistake you can correct this with some concealer and a liner brush to give you a crisp line back. The Bourjois Liner Feutre is just £6.99 and is available from Boots and Superdrug in I believe five different shades. Can you recommend any reasonably priced coloured felt tip liners for me?